This week Kitsap County was blasted with ice and wind. For some reason Kitsap got the brunt of the wind Monday night. With over 50,000 customers out of power for over 24 hours, we were one of thousands of households coaxing the room temperature with gas and wood to ward off pipe freeze, let alone occupant freeze. In our midday walk through Southworth on Tuesday, Esther and I came across this unfortunate casualty of the storm. I had a hunch this cabin cruiser wouldn't hold its mooring off Olympiad Drive. 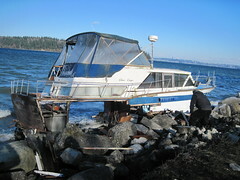 This is the second cabin cruiser that 'bit the dust' or rather 'smashed the rocks' in Southworth this fall. While sailboats seem to weather the storms a little better, these tubs are not sleek enough to cut through wind and wave. My marine treasure is safely moored beside the house. Now that the power is back on, we will head to Lynden for Thanksgiving.